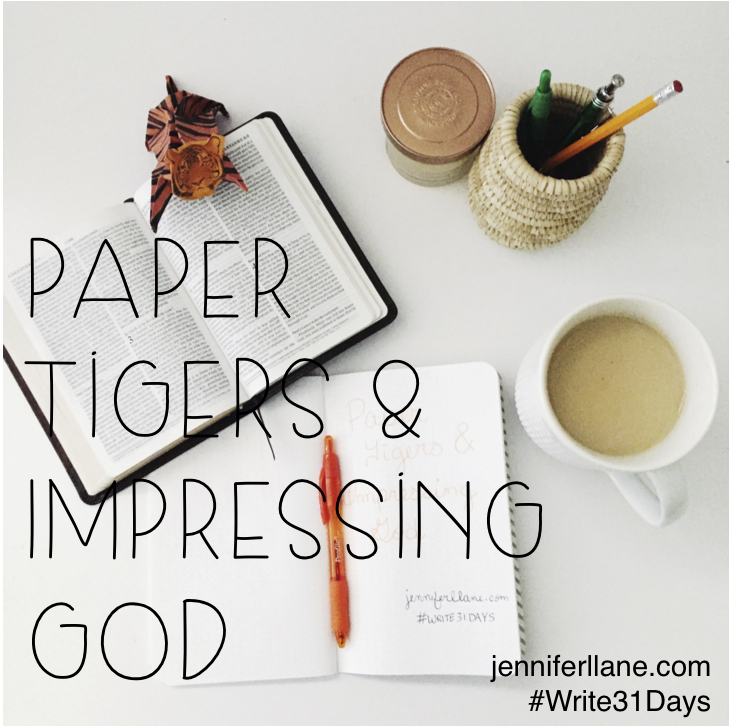 Part of trying to figure out the issue of impressing God leads me to examine motivation. I have been trying to examine why I do things. Why do I serve God? Why do I sacrifice time and money for Him? Sometimes I don’t like my answers to these questions. The most frustrating thing is that I can’t figure out what the correct answers are. My humanity can let even the most canned Sunday school answers turn self-serving. I want to serve for the right reasons, and I want my offering of time and money to be pure. Is that even possible? Maybe I should just take on Paul’s attitude of “what does it matter” in Philippines 1. Being honest with God is so simple, but sometimes it is hard for me. If I’m trying to impress God, I don’t want to say something to Him that I know He’s not going to like, even if I know deep down that He already knows what I’m feeling and thinking. As humans with a nature to sin, it is impossible to have our motivations pure all of the time. We cannot share the gospel and serve others always in truth, good will, grace, and love. We can try, but we will never do it perfectly. Paul says in Philippians that the gospel is proclaimed every single, stinking way that it is preached. If it is out of good motivations or bad, either way, Paul says that he rejoices that the gospel is advanced. God can use your serving Him, even when it is done with bad motivation. We continue to please God in all that we do and advance the Gospel, even when our heart isn’t right. Because truth be told, if we stop and start analyzing our motivations, they are never going to look right. Let us do our best to serve in truth, good will, grace, and love, but as we fall short, because we will fall short, keep advancing the gospel. Looking back at my service to Him over the last few years, I see it steeped in wanting to impress God. God used my service anyway. I can see that the gospel was advance, even when my motivations smelled yucky. I thank God that He is teaching me to stop trying to impress Him. I am so thankful He is showing me how much He loves me, no matter what. Knowing this motivates me to serve Him more. I like to share a song with each blog post because music makes me happy. Jack White is the best guitarist of my generation, and even when he's covering a borderline silly song, he's genius. Learning about other cultures makes you aware of your own culture. Someone pointed out to me that people in Northern Africa have a very community based identity, and I can help but notice this same attribute in so many other world cultures. Having your identity defined by your tribe or family is very different from the culture I grew up in. It brings America’s culture of individualism more glaring into view. When I read the letters of the Bible, only a few of them were written to an individual. There were some letters written to Timothy, one to Titus, and one to Philemon. 17 of the 21 letters were written to a specific congregation or multiple congregations. They were written with to an audience with a different culture than ours, a culture with community based identities. As you read this passage from Philippians, imagine it was written to your local church, in the way it was written to the church at Philippi. Reading that passage with a community mindset, it takes on a different life in your mind. I don’t imagine Paul telling me to humble myself personally and serve, but I imagine Paul telling my people to come together humbly and serve together. As an individual, we absolutely should take on the humility of Christ and take the form of a servant. It is a life-long process of sanctification. This process is spiritual growth. As a church body, we should also be taking on the humility of Christ and taking the form of a servant. That means, not just serving each other, but serving our cities and communities. Our church should look at the people who are not yet part of the global church, those that do not know the life-changing news of the gospel, and count them more significant than our congregation. I don’t see that happen very often. I don’t think it’s because people in churches are selfish jerks either. I think there are a lot of reasons that answer the question of why this isn’t happening in most local churches. Groupthink is defined as the practice of thinking or making decisions as a group in a way that discourages creativity or individual responsibility. This is a real thing. It has been proven by psychological testing. When humans get together and try to make discussions as a group, creativity goes by the wayside and so do our biggest individual core values. As a Christian, we know we value serving others, but as a group, that individual responsibility of serving others gets lost. It takes serious creativity and risk-taking to serve those outside the church. Groupthink is killing our ability to do this. Changing the current situation takes a big momentum shift. It is extremely difficult to change. Making changes in church culture or policy sometimes ends in pastors being fired or people changing churches. Those kinds of high-stake consequences make change almost impossible. It is just a fact that our flesh is drawn to easy and comfortable. We don’t even think about how much we depend on the comforts of our homes and inward-focused churches. It is only when our comforts are challenged that we even consider how we operate. When we remodel our kitchen or go on a mission trip, we are thrown out of our comfort zone and question bigger decisions. When things our comfortable, we rarely think about the big picture. Many church members see their church as a type of club they belong to. They view their tithes as dues, and it is awesome when your club has great benefits, a gym, great childcare, free coffee, cool t-shirts, fun trips, or cool camps. Every church struggles to fill nursery volunteer slots and teaching roles. Church leaders and members can view those empty slots and built a narrative of scarcity. They see those empty service positions and they decide that their congregation doesn’t have an interest in serving. The fact is that nursery workers and teachers will be hard tasks to find volunteers for until Jesus comes back. The true narrative is that congregations are full of people who want to serve, have diverse talents to give, and would gladly use those talents to reach the lost in their community. They just don’t want to change diapers, and who can blame them. So how do we stop the groupthink and change the status quo of local church? How do churches begin serving their city and community? The worst thing you could do is get mad at your pastor or church leaders. They are working hard in an emotionally and spiritually difficult job. They don’t need someone upset; they need someone set free. I think the best thing you can do is start a work and invite church members to take part in your act of service. Start small and get your pastor’s blessing. You pastor might or might not the church’s name associated with your service project. Be ok with it either way. Call it the Philippians Project if you need to. Find out something your community needs and serve them. Find someone that isn’t a part of the Church, and find a way to show them that you count them more significant than your congregation. Reading this, you might realize that I began this post telling you to think less individualistically, and now I am telling you to act individualistically. In a perfect world, we could change our church culture and make it more outwardly focused on a dime. The reality that we discussed makes this impossible. Do what you can to peacefully change your local church’s culture and focus, but that is going to take time. If we wait for those changes to happen before we begin serving our community, forget it. You might as well pray your great-great-grandkids will have fun serving their community with their church. You are the church. You change your actions, invite your church members to join with you in serving, and I think outwardly-focused service will be contagious. As you serve your city, you will grow spiritually. You will become more humble. You will become more like Christ. I’ve blogged about this before, but in case you missed it: I have social anxiety. I have a hard time being around people. One of the biggest parts of social anxiety is feeling like everyone else is in a group that I’m not in. In my head, when I let it go to that place, I decide that everyone likes everyone else, and that everyone else doesn’t like me. I know it is silly. Social anxiety doesn’t follow logic or allow logic. Here’s the problem. Christians need community. I’m beginning to realize something. My social anxiety exists because deep down I am longing for community. I want to belong. If I didn’t care, I wouldn’t have the anxiety. Here’s the reason we need community. Most evangelism and social justice work happens in groups. As a Christian we are called to do a couple of things. The first and most important is the great commission. We are called to make disciples. Gathering people to bring them into knowledge of Christ can look a lot of different ways. Almost all of the opportunities I have to be evangelistic or to disciple young Christians have been in groups: Bible club, Sunday school, mission trips, summer bike lunch delivery, and church outreaches. The other thing we are called to do as Christians is to job of social justice. This season of my life, God has called me into orphan care ministries, and much of our work at my church, Citychurch, involves fatherless children. All of this work has been done in community with my church and orphan care groups. Even our adoption that is still in the waiting stages has involved many other Christians. So many friends and family have prayed for us and participated in our fundraisers. When I realize the importance community plays in the work of the Kingdom, no wonder Satan would love for me to be engulfed in anxiety. The anxiety that I suffer when I interact with other people is a huge attack on The Church, His community. I am convinced (because I get so much response when I talk about anxiety and because Brene Brown is a best selling author) that so many people suffer the same attacks that I do, causing them to draw away from community. If you are one of those people, let me encourage you to see those thoughts for what they are, spiritual attacks, and inspire you to realize that doing the hard work of overcoming the anxiety is important to the Church. It has been hard for me to recognize when thoughts during social anxiety are true or untrue, but learning how to separate those thoughts from truth and thoughts that are from the roaring lion who seeks to devour me is important to overcoming anxiety. It is not easy, but find some wise council that can help you begin to disprove your anxiety driven thoughts. Becoming a part of community will encourage your growth as a Christian, increase your dependence on God, and your effectiveness as an active part of the Church. Remember these words in 1 John because it reminds us of the love God has for us each individually. I love music, so I like to include a song with every blog post. Here's a beautiful song about a guy that doesn't quite fit in with others. The thing I love about Andrew Bird is that he likes to make up his own words. Why not? A few of weeks ago in Oregon, I was riding the public transportation to the airport with my friend Kaylie Hodges. We had to get off downtown and switch trains. That’s where we saw him coming, a homeless man asking for handouts. He told us his story, one I’ve heard from homeless men before. My grandma has died; I’m out on the streets trying to travel to another state. He had no way of knowing that I’m well versed in talking to homeless. Citychurch is in the crosshairs of the three biggest homeless outreaches downtown. They walk past our building on their path between those resources. He didn’t know I had already made up my mind when I saw him start walking my way. I have a strategy. I almost never give a monetary handout to homeless men, but if I feel like I need to, he’s going to hear about Jesus and get a prayer. He could throw out any name, and I was going to keep talking. His goal was to talk me out of a couple dollars. My goal was to get our subject to switch to Jesus. We continued talking until I saw our train approaching. I took his hand, and I said a quick prayer for him. I handed him a few dollars, and we got on our train. Kaylie immediately complemented my boldness, which I wasn’t sure I agreed with. It’s easy to talk to homeless people about Jesus. I don’t have anything invested in their response, only Jesus does. It’s much harder to talk to my peers about Jesus, someone I respect. I thought about my strategy for talking to this man. I immediately knew where I had gotten this idea. I had come up with this “Jesus talk” strategy to deal with people that you don’t mind scaring away in college. My first semester of college, I attended Stephen F. Austin State University, and I shared a dorm room with my high school best friend Cheryl. Cheryl and I had the best time that semester living together. We ate a lot of greasy pizza, watched a lot of tv, and spent a lot of time acting silly. Cheryl is still one of the best people I've ever known in my life. My dorm room at SFA University. I was deep into The Beatles, and the first movie James and I had seen together was The Lion King. I have no defense for the George Clooney pictures. It was the 90s, and our room had a landline. I don’t know if dorms still have phones. I would be surprised if they did. Cheryl told me that if it was my idea, then I was going to have to do it. We went on with our dorm room activities. I can’t remember what that activity was, but I can only imagine it included rearranging school supplies in our backpacks and desks, light studying, or something equally as nerdy. I do remember that feeling of butterflies as we waited to see if our phone would ring again. It did. I picked up. I began one of many conversations I would have about God with a young man from, of all places, Oregon. This prank caller became our friend. We ended up spending a lot of time with him. It turned out we didn’t scare him away. We didn’t immediately convert him, but that call gave me some confidence, some boldness. If I’m honest with myself, I know that I had nothing to lose in either of these “bold” scenarios. I would not lose a bit of reputation or skin in talking to these strangers about Jesus. I don’t feel proud of myself for proclaiming truth to someone I might never see again. One of the things that is important to me as a Christian is how I have shared my faith with others because I don’t want to be the servant who buries the talents I’ve been given. Honestly I don’t know how to rank these times of sharing. Are they garbage evangelism? What if I told you that that boy in college became a Christian? Does that make it rank higher? Is it even fair to rank them because aren’t all people important to our Lord? Sharing your faith with someone you have a relationship with is definitely more difficult. There could be real consequences. Your conversation can shift or even end your relationship. Does that danger impress the God who spoke our universe into existence and grants my every breath? The truth is that I don’t know how important any conversation might be. God can use any, all, or none of the times I share my faith to change someone’s faith in Him. The important thing is to keep sharing out of a sincere heart. I do care about that homeless man. I looked him in the eye, asked his name, held his hand, and I talked to God with him. I doubt that happens a lot in the the streets of the very secular city he is living in. How many travelers from the Bible belt have done that for him? And do we believe that God can answer prayers about a man addicted to drugs, living on the street? Share your faith whenever you’re given the opportunity. Bold or not, It is the sharing that is important. It is showing love that is crucial. I can't mention landlines and not play this song.